#7247 Big Buddees Circus Cuddlers "Pacer Pony"
Description: Pacer Pony is a large Smooshee from the Circus Cuddlers line. Pacer was sold with a caged circus car that she can be smooshed into. Designed for children ages 4 years and older. 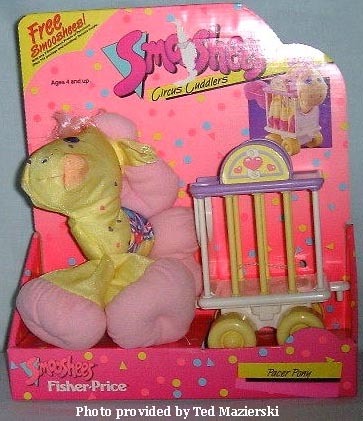 FPT16219 - Pacer Pony - Large stuffed cloth pony Smooshee with a pre-printed face and other features. Pacer has a yellow head and body, a light pink mane and tail, and light pink pads on the bottom of her feet. She has large blue eyes with a purple heart around one eye. She has a printed circus saddle on her back with a blue seat, purple edgeing, and pink hearts trim. She has multi-colored heart-prints on the sides of her body and neck. Prancer also has a long strand of light hair in the middle of her forehead. FPT16220 - White circus train car with white walls on the ends and yellow bars on the sides. The cage has a purple roof, and a litho on the end with "Pacer Pony" and a pink hearts on it. The car rolls on 4 yellow wheels, and it has a hitch on the front and back to connects to other cars used in the Circus Cuddlers line. This set was sold in a 10-7/16" long, 11-3/4" high, 4" deep display box.